The Bears made the playoffs in 2018 and were a missed kick away from advancing at least to the Divisional Round. Those improvements were — as they often seem to be in Chicago, for whatever reason — largely on the defensive side. Chicago fielded the best defense in the league (NFL-best PFF grade of 93.1) on the back of preseason trade acquisition Khalil Mack, but the offense (71.2 grade, 23rd) was less dominant. 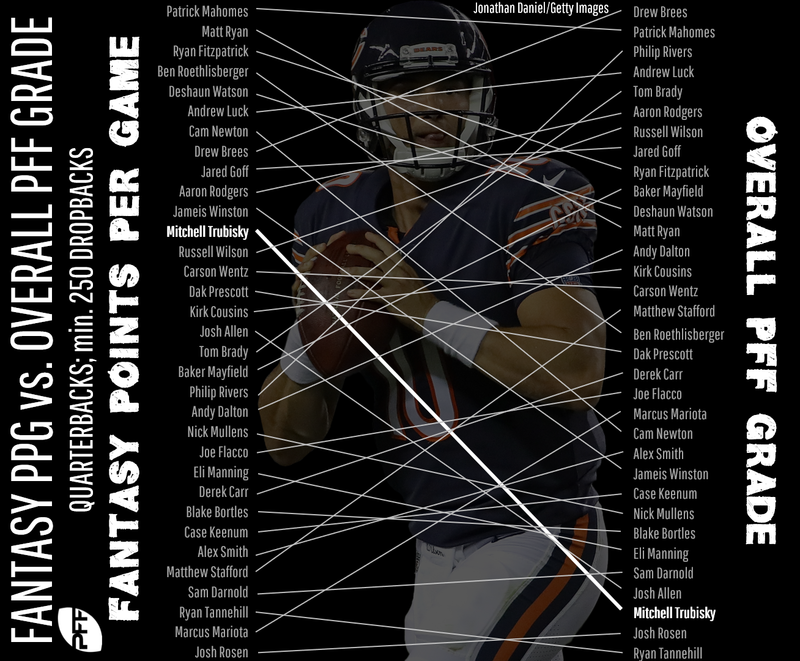 Quarterback Mitchell Trubisky hovered around the league leaders in fantasy scoring for a big chunk of the season, but his 56.5 passing grade (31st of 33 quarterbacks with at least 250 dropbacks) showed that his fantasy numbers might have been a bit of a mirage. With timeshares at running back (Jordan Howard and Tarik Cohen) and wide receiver (Allen Robinson, Taylor Gabriel, and Anthony Miller), the Bears scored plenty of points but didn’t offer much in the way of fantasy security. With a desire for more trustworthy production in mind, here’s a look at three offseason moves we’d like to see the Bears make in 2019. This move would pretty obviously necessitate jettisoning Howard, but it seems at this point the new coaching staff isn’t enamored of the holdover running back. His PFF rushing grade has fallen each of his three seasons, with his yards per carry dropping below 4.0 in 2018 (to 3.7). All while never being much of a contributor in the passing game — and even less so since Cohen’s breakout. Ingram, meanwhile, is a more well-rounded offensive weapon, enabling the Bears to be more flexible at the position rather than “Howard’s on the field, probably a run; Cohen’s on the field, probably a pass.” The Bears had a good enough offense in 2018 considering the stout defense, but with that defense likely to regress (because everything does), an offensive upgrade to a more well-rounded running back (who wouldn’t command a Le’Veon Bell-like salary or workload) would be just the right medicine. As noted in the PFF piece on offensive needs for all 32 teams, the Bears didn’t actually have a glaring weakness in 2018. Their biggest potential weakness, the impending free agency of RT Bobby Massie, was resolved when the team re-signed him to an extension already this offseason. As a result, the Bears should bring back all 11 offensive starters next season. Still, the team was only middle of the road as a run-blocking unit, with a 59.6 grade, and betting on a crew of offensive linemen to stay largely healthy two seasons in a row is a dicey proposition. Better to add a name or two in the draft just to be sure.